Gunnery Sgt. Christopher H. Farnes, senior drill instructor, Platoon 6167, Company H, foreground, and Capt. Partick L. McAnany, series commander, Series 2161, 2nd Battalion, Recruit Training Regiment, march down a line of recruits to begin the final look-over before they are inspected during the Battalion Commander’s Inspection on the Marine Corps Recruit Depot’s Shepherd Memorial Drill Field, March 2. 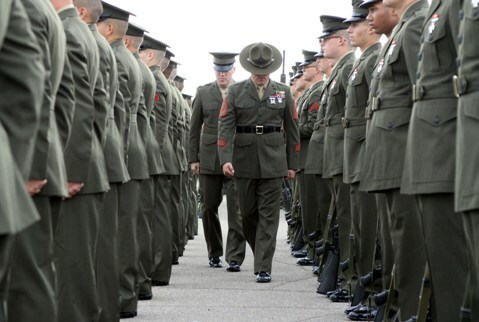 The inspection is the final test recruit’s must pass to graduate from recruit training.